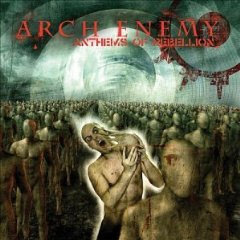 Hall of the Mountain King: Review: Arch Enemy, "Anthems of Rebellion"
Review: Arch Enemy, "Anthems of Rebellion"
Arch Enemy's second album with new vocalist Angela Gossow shows the band continuing to grow and broaden its horizons. While Gossow spent much of her debut album with the band, last year's "Wages of Sin," proving that she could hang with the boys, she stretches out a little on this album. On some of the songs, you can actually tell the vocalist is female. That's not to say there's any angelic crooning here. It's just as aggressive as ever. 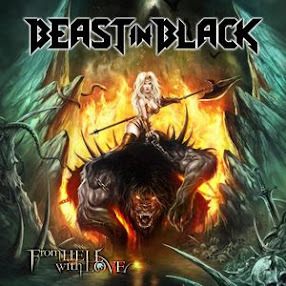 The music continues to drift more and more toward thrash and the band continues to add some nice melodic touches. The psychedelic influence of Michael Amott's side project Spiritual Beggars invades the dark corners of the album, and "Exist to Exit" is an unabashed homage to the band's forefathers Slayer. Overall, "Anthems of Rebellion" is a pretty daring album for a band in a genre where fans love to toss around the word sellout. Arch Enemy breaks new melodic ground on tracks like "Instinct" and the outstanding track of the album "Leader of the Rats." Of course, there are still the burners like "Despicable Heroes" and "Saints and Sinners" for those longing for the band's older sound. Arch Enemy has hit its stride with "Anthems of Rebellion." It's a perfect blend of guitar-fueled aggression and dark melodic sensibilities. It lives up to the promise made on "Wages of Sin" and promises even better things to come.